Now a long-rumored all-electric (not its half hearted 330E) version of its popular BMW 3 Series is reportedly going to be unveiled in September. Earlier this year, BMW confirmed a few new electric vehicles to come to production. It revealed plans to build the first fully electric MINI in 2019 and a fully electric BMW X3 in 2020 at its Leipzig plant, while the upcoming “fully electric BMW iNEXT” should follow in 2021. It left a giant 6-year gap between the release of its first all-electric vehicle, the BMW i3, and its next all-electric vehicle. An electric BMW 3 Series has long been rumored and it would make sense to bridge the gap, but it never officially appeared in the company’s plan, while they were not shy about confirming plans for an all-electric BMW X3. Now German newspaper Handelsblatt reports citing company sources that an electric BMW 3 Series is planned and should be unveiled as soon as in September at the IAA auto show in Frankfurt. If the rumors are true, Frankfurt could be an interesting show for electric vehicles since Honda, Jaguar, Mercedes-Benz and Volvo are all also rumored to unveil EVs at the event. They are reportedly aiming for a range of ~400 km (250 miles), but they are likely referring to NEDC-rated range and therefore, the real-world range could be closer to ~200 miles. 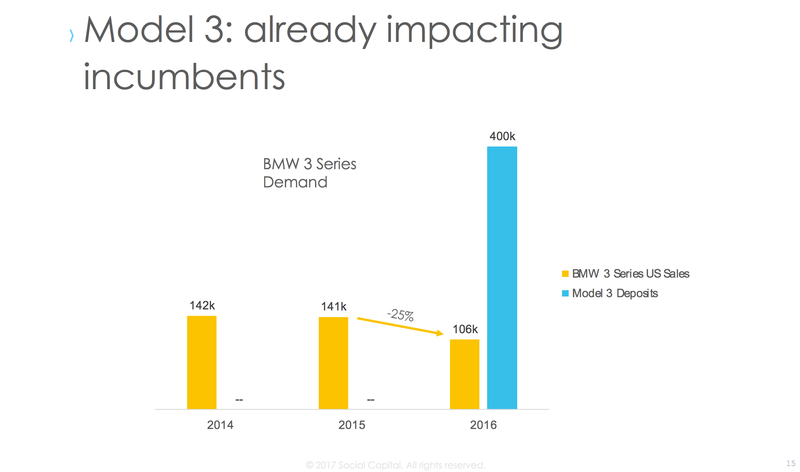 BMW is definitely looking to compete with the Tesla Model 3, which some say is already affecting the vehicle’s sales.